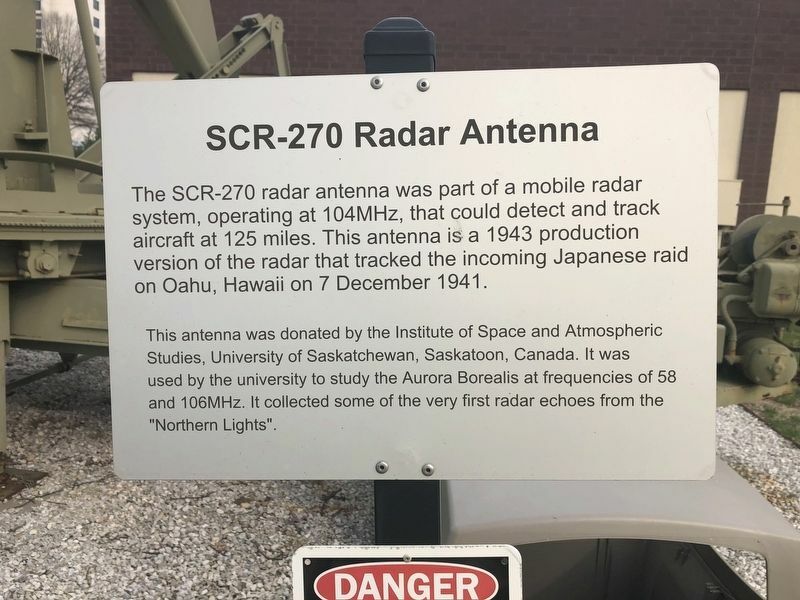 The SCR-270 radar antenna was part of a mobile radar system, operating at 104MHz, that could detect and track aircraft at 125 miles. 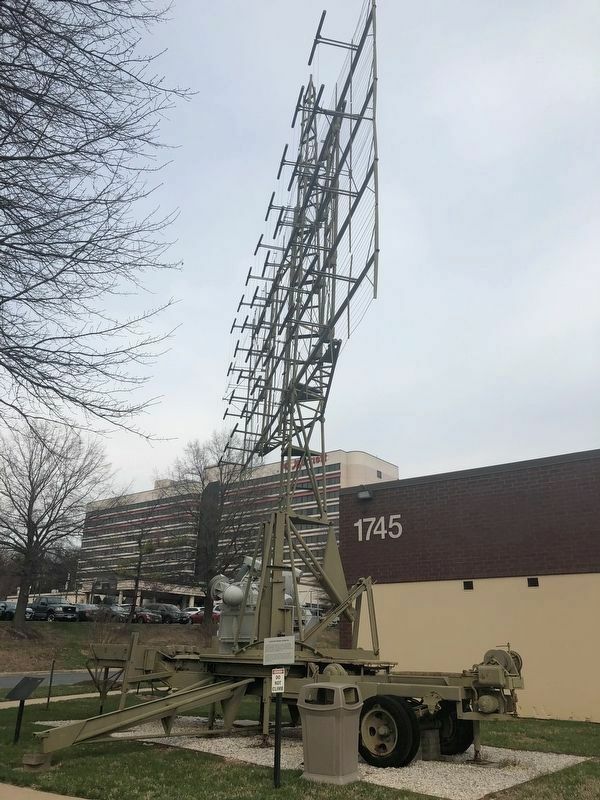 This antenna is a 1943 production version of the radar that tracked the incoming Japanese raid on Oahu, Hawaii on 7 December 1941. This antenna was donated by the Institute of Space and Atmospheric Studies, University of Saskatchewan, Saskatoon, Canada. It was used by the university to study the Aurora Borealis at frequencies of 58 and 105MHz. It collected some of the very first radar echoes from the "Northern Lights". Location. 39° 11.755′ N, 76° 41.067′ W. Marker is in Linthicum Heights, Maryland, in Anne Arundel County. Marker is at the intersection of West Nursery Road and Elm Road, on the right when traveling north on West Nursery Road. Touch for map. Marker is at or near this postal address: 1745 West Nursery Road, Linthicum Heights MD 21090, United States of America. Touch for directions. (within shouting distance of this marker); Nike Ajax (within shouting distance of this marker); FuG 65 Wurzburg Riese (Giant) Radar Antenna (within shouting distance of this marker); XAF Radar Antenna (within shouting distance of this marker); Stoney Run Train Station (approx. 0.8 miles away); Elkridge Furnace Inn (approx. 1.6 miles away); Linthicum Heights (approx. 1.8 miles away). Touch for a list and map of all markers in Linthicum Heights. More. Search the internet for SCR-270 Radar Antenna. Credits. This page was last revised on March 31, 2019. This page originally submitted on March 31, 2019, by Devry Becker Jones of Washington, District of Columbia. This page has been viewed 47 times since then. Photos: 1, 2. submitted on March 31, 2019, by Devry Becker Jones of Washington, District of Columbia.